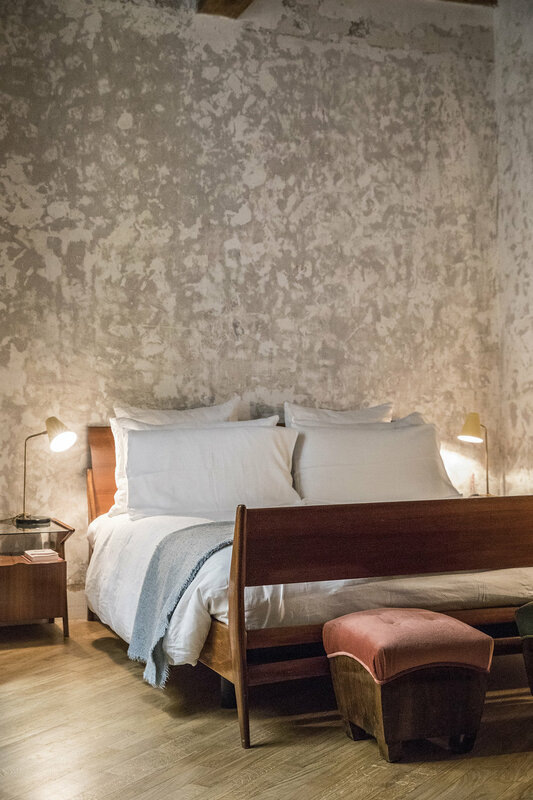 Set on a little square in the heart of Centro Storica is boutique gem G Rough. With only 10 suites, this hotel is tiny but offers full-service. Upon check in we walk up to a slick bar and perch ourselves in front of an immaculately presented host. "Checking in?" he asks. "Si" we reply. Then what follows is not a request for our date of birth or identification but our caffe latte order. We've only been here a few minutes but we're feeling authentically Roman. Bags are whisked away to our suite as we chat away to the charming staff. The hotel is set in a historic building which the owner converted in to suites clad with designer Italian furnishings. The lobby glimmers with rich golden tiling and dark leather armchairs which is the perfect spot for aperetivo hour. Rooms are spread out over the upper floors which are accessed by a small elevator or a narrow staircase. Walking up stairs the walls are adorned with modern art and signage leading to suites with a courtyard or street view. Our room has a luxe warehouse feel with raw exposed walls and wooden floors. There's a rich polished oak table and chair that sits in a window corner, while a blush pink velvet couch is framed by an overhanging lamp making it a cosy reading spot. There's a plush bed layered with soft linen sheets and a mini bar that is quintessentially Italian. There are books scattered about, mostly on architecture and design. But the real gem is the owner's insider guide which outlines brilliant restaurants, bars, galleries and boutiques in the area. Breakfast is served downstairs which offers a fabulous offering of salumi and cheeses (sourced from famed institution Roscioli), breads, tart of the day, pastries, fruit and cereal. There's an additional menu should you want eggs or pressed juices made to order. In the afternoons it's lovely to sip on an Aperol Spritz and watch people walk by before heading out to one of the stellar restaurants in the area. For Rome, it doesn't get much better than this. We were guests of Mr and Mrs Smith.